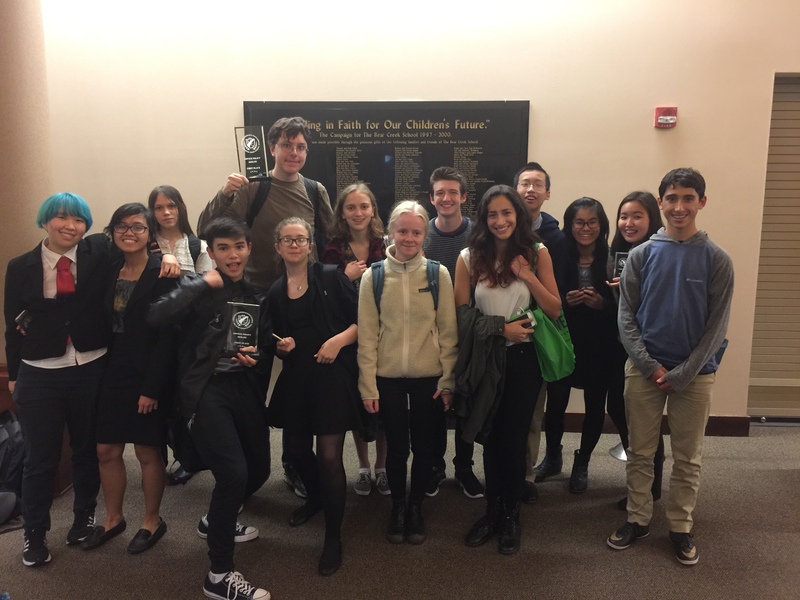 Garfield travelled to Redmond this weekend to participate in the 5th Annual Grizzlies Forensics Invitational at The Bear Creek School. It is very exciting to see how much Washington State Policy Debate has grown over the past few years… we had four teams in the novice division and four teams in the varsity division. In total, there were 29 policy teams at the tournament, which is much larger than we have ever seen at Bear Creek before! Despite the amount and quality of the competition, our debaters enjoyed quite a bit of success! Don and Carl won the novice division of the tournament, after beating Kamiak in the finals! They were undefeated throughout the entire tournament, an incredible accomplishment! They were excited to get some giant trophies out of the experience, as you can see in the photo above. And, this wasn’t our only success in the novice division… Quan and Sara placed 3rd in the novice division, winning four of their six rounds! We are so very excited with all the success our novice are already having this year, and how much work they are putting into the activity. The future of Garfield debate certainly seems to be looking good! At the varsity level Stella and Petra placed fourth overall, and just narrowly missed breaking to the finals round. While we would have liked to be in that finals round, I was really happy with their first showing as new partners. Expect big things from them, and the rest of the varsity, as the season continues! Luke and Hannah also went 4-2, which is fantastic! A special thanks to Griffin for agreeing to judge novice rounds for us. Also, thanks to the varsity for helping the novice throughout the tournament, and to Ms. Glinski for her continued hard work as the new assistant coach. It is team support like this that has made the team so successful!